Fresh from starring in 'Britain's Got Talent - The Big Celebration' in Liverpool, England at the weekend, musical theatre group Collabro have jetted in for an Asian Tour that will see them perform for the first time here in the Philippines at Resorts World Manila on February 26. The hugely-popular four-piece act comprising singers Jamie Lambert, Michael Auger, Matt Pagan and Thomas Redgrave will launch their Asian shows with two concerts in Japan before arriving in the Philippines' capital for the first time. 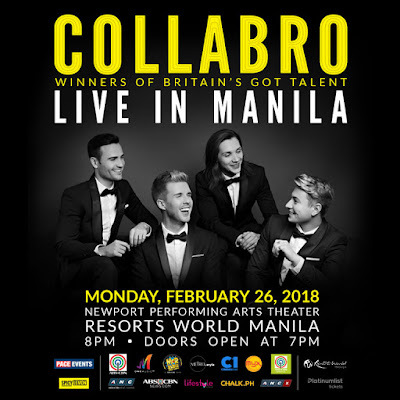 As well as performing for their army of "Collaborators" in Manila, the four British singers are lined up to make several TV appearances on popular ABS-CBN productions 'ASAP', 'Showtime' and 'Umagang Kay Ganda' to showcase the vocals, style and charisma that have helped win millions of fans around the world. Four years ago this week, the boys stepped in front of TV's 'Britain's Got Talent' judges Simon Cowell, David Walliams, Amanda Holden and Alesha Dixon for an audition that blew away the judges and resulted in a standing ovation from the entire theatre. Today that audition of the song "Stars" from "Les Miserables" is as popular as ever with over 40 million views on YouTube alone. Legendary TV and music mogul Cowell described it as: "… an absolutely brilliant audition - brilliant" and the British public agreed voting Collabro as the show's winning act for 2014. 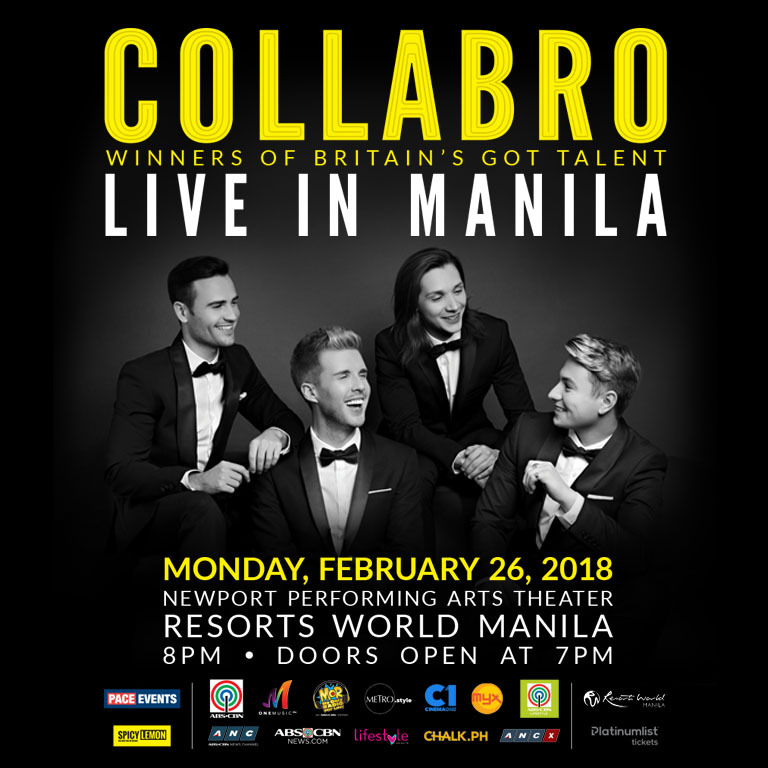 "We are all looking forward to working with Collabro on making their first ever show in the Philippines a great success," said a spokesman for event producers and promoters Spicy Lemon. Remaining tickets for the show at the Newport Performing Arts Theater, Resorts World are on sale online from www.platinumlist.net or from the Box Office at Resorts World. For more information, contact Spicy Lemon on +63 995 9276776.